A call monitoring solution that transcribes conversations and provides coachable call analytics for teams. Pros: When we used to sit down with our junior SDRs, we'd hand them their 5 scripts, then walk away. Not until recently did we have a structure for providing coaching to each rep. However, even once we started meeting regularly, as managers we didn't know what to focus on, or how to customize our feedback for each rep.
VoiceOps data showed us immediately where to focus for each rep, exactly what skill/tactic is being ignored, and the context for exactly where we see those tactics used by our best team members. It's made our sales coaching effort a more effective process, one that we may not have continued with had we not started digging into our call data. Overall: Unclear what to focus on w/ sales coaching. This has provided that clarity, and we no longer have to listen to hours of call recordings. Thanks Dave! Always appreciated. Let us know if there's anything we can do to make the experience better or the product more functional. Pros: We had a pretty complex process for providing feedback to new SDRs as we onboarded them. Most of the feedback was instinctual, and therefore changed depending on which manager was giving the feedback. 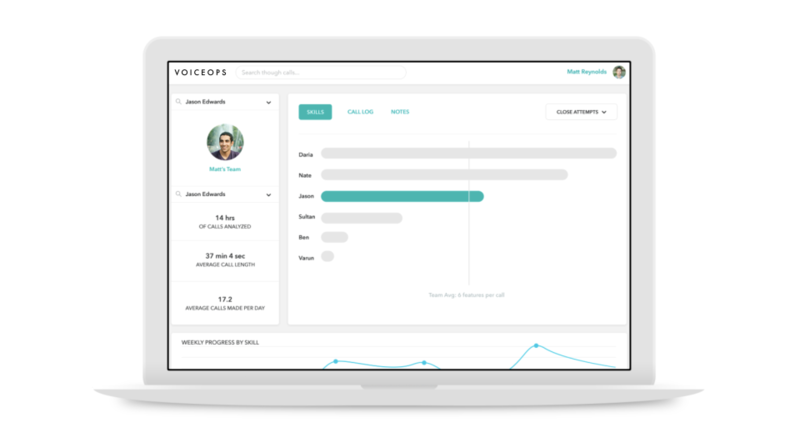 VoiceOps isn't based on instinct, it's based on data across all calls, so we were able to have consistency in our coaching. That's been huge for us. Overall: We had inefficient call shadowing and training for new SDRs. This helped us speed that process up, almost automating the process of preparing for feedback sessions. Whether or not it's a direct effect of the tool, we've also seen a huge increase in cross-selling and up selling from our entire team. Hard to imagine VoiceOps didn't contribute to that increase. Thanks for the kind words, Cameron. We'll keep plugging away on the product, but glad we're making your sales coaching an easier, more effective process. Pros: Accurate transcription, team-wide rollups, breakdowns by skill but easy to drill into calls and see context. Overall: We had zero insight into the difference between our top performers and bottom performers, or any real sense of what our reps are actually saying on their calls. VoiceOps solved both of those issues. Thanks Tymour - we appreciate your feedback and having you as a customer!